Posted on 31, October 2016 by EuropaWire PR Editors | This entry was posted in Construction, United Kingdom and tagged Design and Construction Framework, engineering, GRAHAM Construction, LLW Repository Ltd, Paul Pointon, Stuart Robertson. Bookmark the permalink. Contract for second half of four year framework. HILLSBOROUGH, 31-Oct-2016 — /EuropaWire/ — LLW Repository Ltd and partner GRAHAM Construction have signed the second half of their major four year Engineering, Design and Construction Framework contract. The contract was split into two-year sections, with LLWR retaining the option to proceed with the second half of the deal, based on performance. GRAHAM Construction was awarded the four year Framework by LLWR in late 2014, and the two organisations have since formed a single integrated team to work on a series of major programmes and projects, including Security Enhancement, Repository Development and Site Infrastructure improvements. 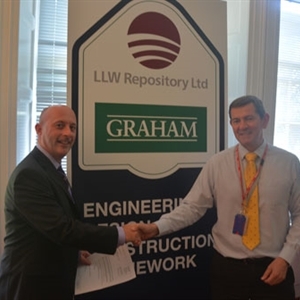 Paul Pointon, LLWR’s Head of Site, said: “The signing of this contract extension is a measure of the confidence we have in GRAHAM Construction to continue to carry out extensive works on our site over the next two years. Earlier this year it had 44 employees working on the Framework, 32 of who were local. An estimated 83 people were also supported through sub-contracting, 90% of which were Small to Medium Sized Enterprises (SMEs). With LLWR support, GRAHAM has also developed 3 STEM ambassadors to work in schools, supported Drigg Gala Day and visited many schools and colleges to talk about the benefits of engineering. Stuart Robertson, GRAHAM Construction, said: “We are delighted that the relationship with LLWR is going from strength-to-strength.